We'll take you through a step-by-step guide and video on how to set up your VPN on Amazon's Fire Stick, Fire TV or Fire Cube. We'll also show you some VPNs with dedicated Fire Stick apps that you can have up and running in around 1 minute. That’s where a Firestick VPN comes in. By encrypting all of your internet traffic and routing it through an intermediary server in a location of your choosing, you can « spoof » your location to make it appear to the content provider as though you are located in another country or region. This makes it possible to unblock geo-locked content on streaming apps like Netflix, Hulu, Amazon Prime Video, BBC iPlayer, HBO, and many more. Furthermore, users who run Kodi on their Amazon Fire TVs and Fire TV Sticks can hide the contents and destination of their internet traffic from snooping internet service providers. 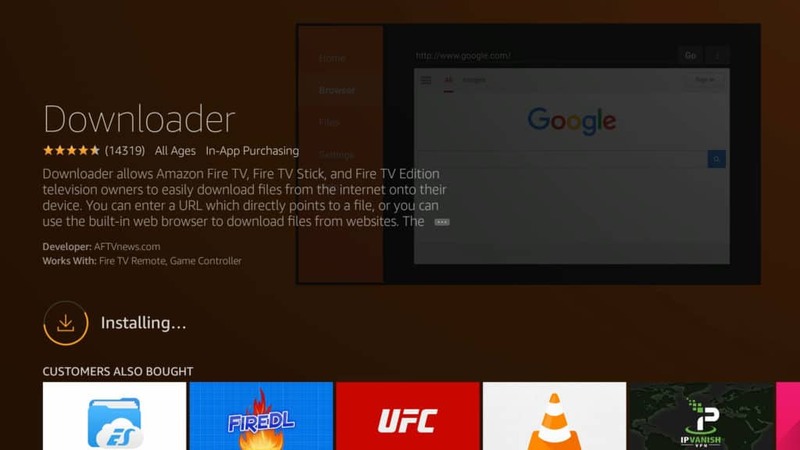 Many popular VPN providers now make apps specifically for Amazon Fire TV, and you can simply search for them from the Fire TV home screen and install them without any fuss. However, if your VPN provider doesn’t make an app for Firestick, you’ll have to use a workaround. 1 What is the best VPN for Fire Stick? What is the best VPN for Fire Stick? If you’ve not already purchased a VPN for Firestick, you’re going to want to make sure you choose one that is up to the job or you may find yourself frustrated. If you don’t want your streaming to be interrupted by buffering (and who does? ), you need a fast VPN service. Many that we test struggle to deliver suitable speeds. All VPNs will slow your internet connection down, but some more so than others. If you plan on installing the hugely popular open-source media player Kodi on your Fire Stick, you will also want a VPN for Firestick that works with all Kodi add-ons and protects your privacy should you find yourself downloading any content in a legal gray area. We recommend IPVanish. Out of the dozens of VPN services we’ve tested, it’s one of the fastest, scores highly for privacy protection, and works with all Kodi add-ons. It’s also one of the easiest to set up because its app is now on the official built-in app store, which is the by far quickest way. The other methods are a bit more complicated, but shouldn’t take long to set up with our tutorials by your side. We’re sure you’ll find a way to get your Fire TV, Fire TV Stick, or Fire Cube connected to a VPN here. Note that we do not recommend using a free VPN for Firestick. A free VPN is typically much more limited when it comes to servers, bandwidth, and data caps. They also tend to have lackluster privacy policies and might be snooping on your data to sell to third-party advertisers. You’re better off with a paid VPN service that’s fast and doesn’t keep traffic logs. DEAL ALERT: Save 60% on an annual IPVanish plan here. 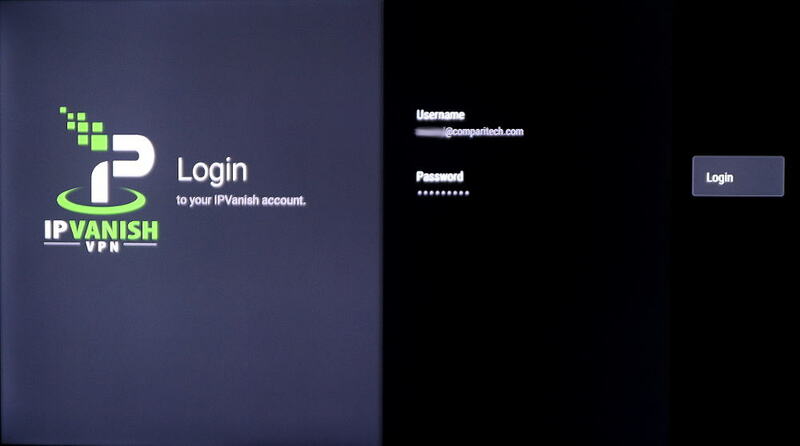 Enter your IPVanish account username and password. This is a pain with the remote control but you should only need to do it once. At this point, you can either click the Connect button to connect to the VPN right away, or select a server. And that’s it! 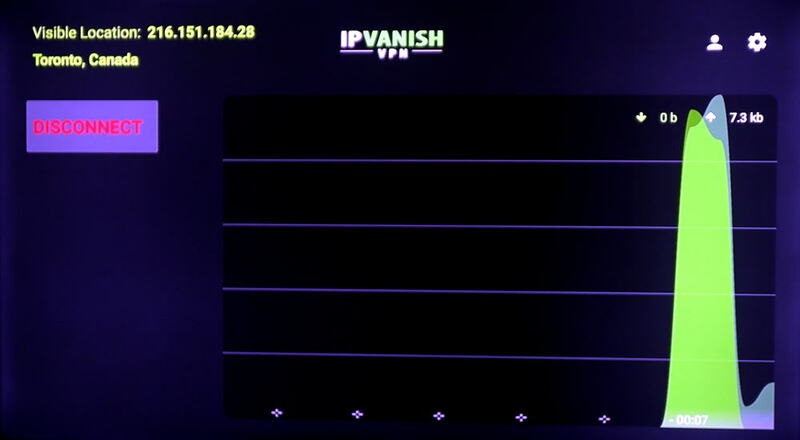 IPVanish is the only reputable Firestick VPN we know of to list its app on the Fire TV app store, so it’s definitely the easiest. Update: ExpressVPN, NordVPN, CyberGhost, and a few other great VPNs now also have apps on the Fire TV app store. 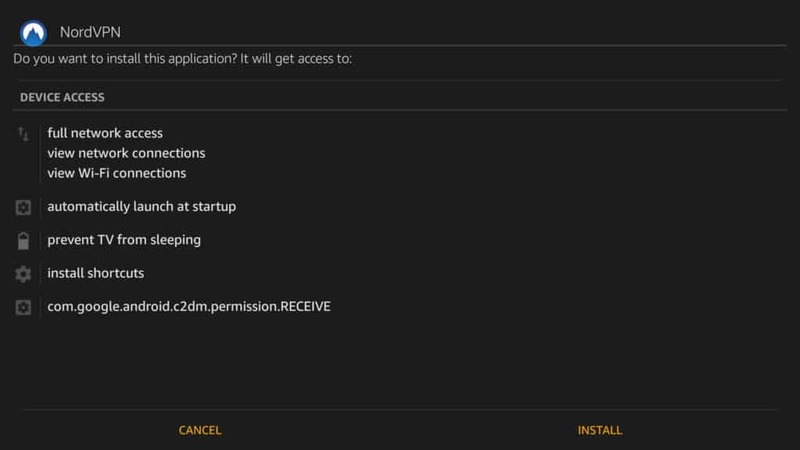 If you want to know how to install another app, however, we’ve got instructions for that below. Important reminder: If you’re currently running a side-loaded APK installation of IPVanish VPN for Firestick (e.g. you previously used one of the alternative methods below), you WILL NOT be able to receive app updates from the Amazon App Store. Instead, you must first uninstall the IPVanish APK before downloading the new native app. 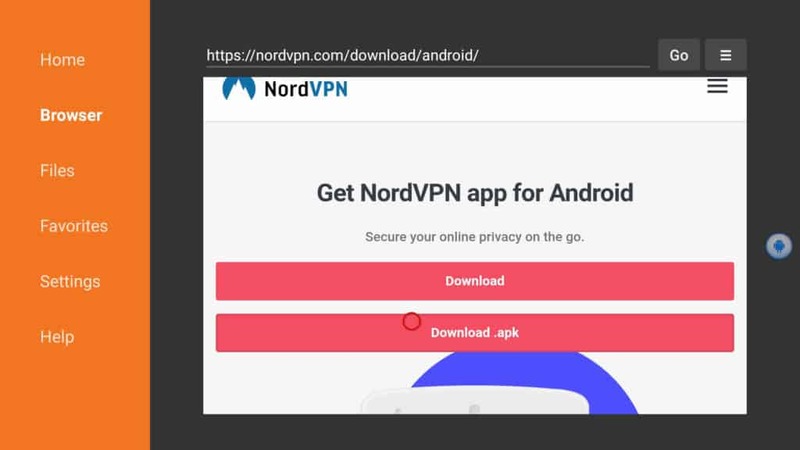 Note that NordVPN released a Fire TV app after we published this tutorial video, so users of that VPN should opt for the app available from Amazon. This video still applies to other VPN providers that don’t make Fire TV apps, though. 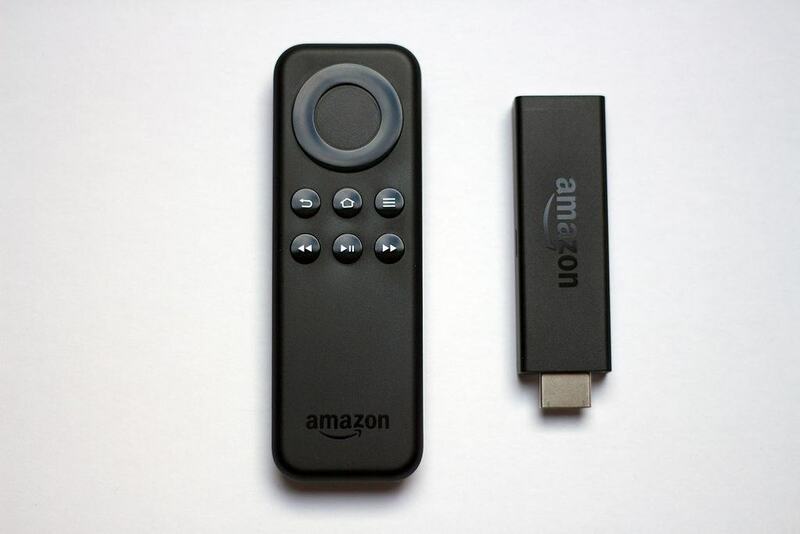 Amazon Fire TVs and Fire TV Sticks run on a fork of the Android operating system. Many VPN providers make Android apps, but Fire TV doesn’t have access to Google Play in order to download them. The first generation Fire TV Stick doesn’t support VPN apps at all. 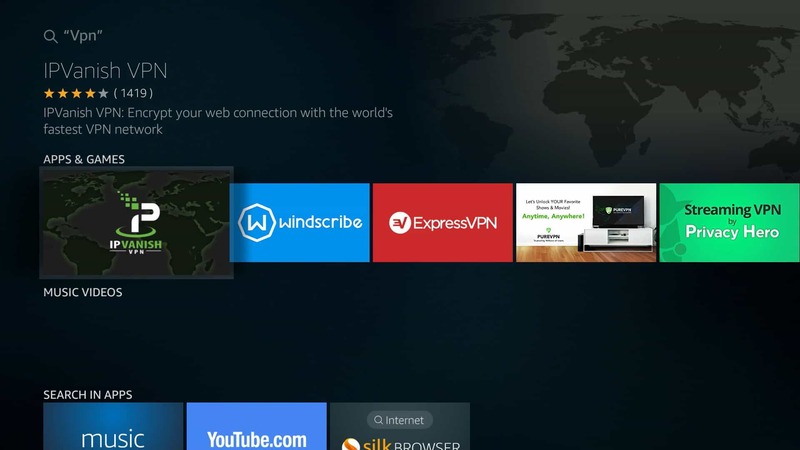 In this tutorial, we’ll show you a few different methods Fire TV owners can use to connect their devices to a VPN, unblock geo-locked streaming content, and keep your streaming activity private. If you’re using a VPN app that isn’t IPVanish or ExpressVPN, it probably isn’t listed on the default app store. We’ll show you a couple other ways to get your favorite VPN on Firestick. Note: These methods are more complicated and may cause issues with updates. While they will work we recommended sticking to IPVanish and the method described above. Jot down the IP address of your Fire TV and keep it handy for method #2. You can now use apps from outside Amazon’s app ecosystem. The most difficult part of this process is actually getting the VPN on Firestick because Amazon didn’t make it very easy to download APK files or use Google Play. You can choose any of the methods below based on what best suits you. This method is easy if your VPN provider makes its Android APK file available via direct download instead of through an app store like Google Play. APK, or Android application package, is the installation file format used by Android devices. We advise you only download APKs directly from the VPN provider’s website. IPVanish, for example, allows customers to download the APK directly from its website. APK files from third parties could be infected with adware or malware. You will need a download URL for the APK file for this method and a 2nd-gen or newer Fire TV Stick. Note that we’ll still use IPVanish as an example here, but we strongly advise IPVanish subscribers to use the recommended Amazon App Store method above. Open Downloader and enter the direct download URL for the VPN app’s APK file. 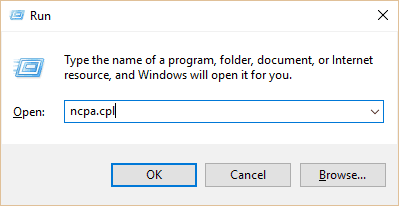 If the URL is too long, you can type in the URL for a page that contains the download link, which will open up a rudimentary browser from which you can download the APK. Sometimes direct download APK files are not openly advertised by the VPN provider. If you can’t find one by searching around the provider’s website, try contacting customer service to see if they can either send you a link or the APK file itself. 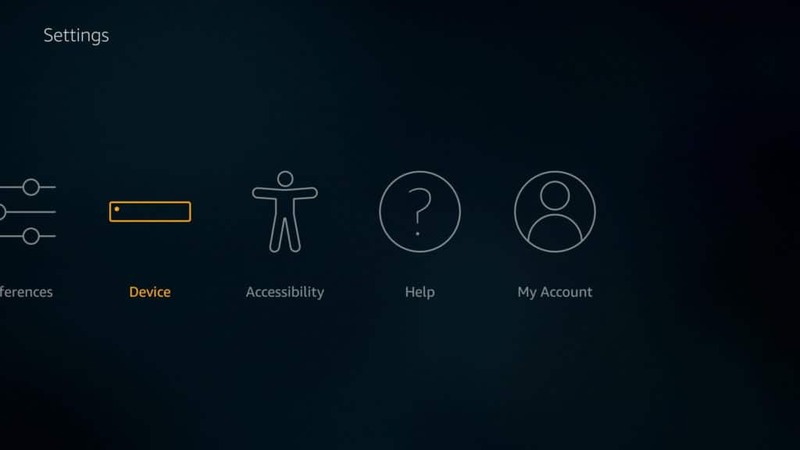 You can upload the file to cloud storage such as Dropbox and download the file using Downloader from there, or you can sideload the APK onto your device by plugging the Fire TV into your computer’s USB port and dropping the APK file into an accessible location. 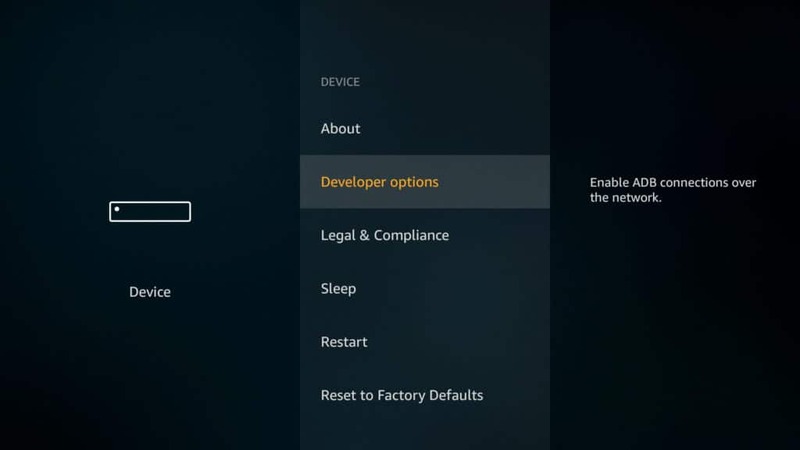 This method requires the second generation of the Fire TV Stick or newer plus a second Android device with access to Google Play, such as a smartphone or tablet. We’ll download the apps to the second device first, then transfer them to the Fire TV using Apps2Fire. If you’re not sure what generation Fire Stick you’re using, look for the model name on the outside. 2nd-gen Fire Sticks have the model name « LY73PR ». Note that if you have an APK file for the VPN app on your phone rather than an installed app, you can also use Apps2Fire, but the previous method is probably easier and doesn’t require a second Android device. Now that the VPN app is installed on your Fire TV, we just need to log in and connect. These steps will vary a bit depending on your VPN provider, but the process is generally the same. The app won’t show up in the top-level Apps menu, unfortunately. Enter your VPN provider’s login credentials. This might require a special mouse app (see below) or Bluetooth mouse. In the VPN app, select a location and hit the connect button. Once the connection is established, you’re good to go! 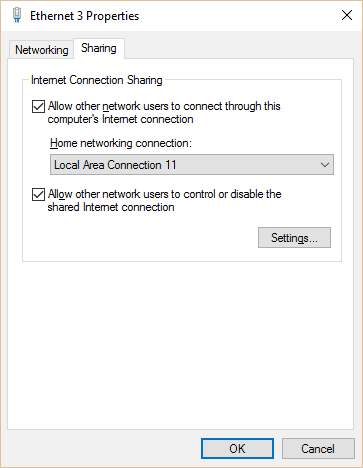 The VPN service should remain connected until the device powers off or you manually disconnect it. If given the option, you can set the app to automatically reconnect should the connection drop at any point. Most VPN apps are made to be used with touchscreens, so controlling them can be difficult or even impossible. You can use a Bluetooth mouse and connect it to your Fire TV if you have one. 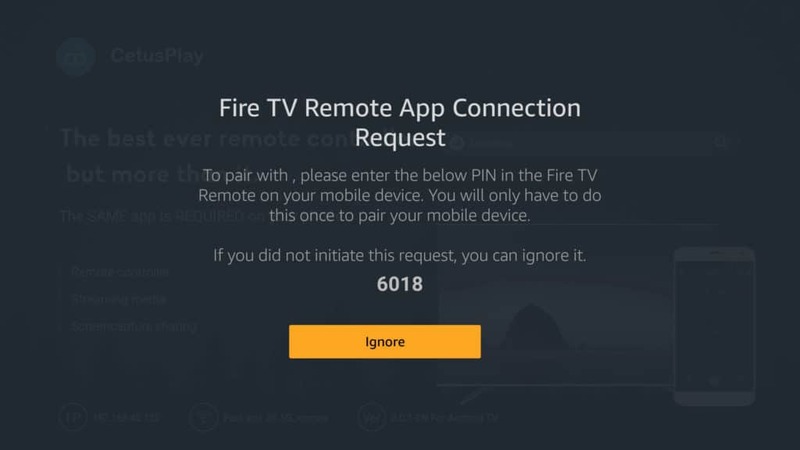 The other option is to use a smartphone or tablet to remotely control the Fire TV. We’ll give you some options for the latter. Amazon’s TV remote app for Fire sticks doesn’t have mouse control; it just replicates the basic functions of the physical remote. After trying a few different third-party solutions, we found the best option to be Remote for Fire TV, which costs $2. For a free option, you can try CetusPlay, which is very similar and is also available on the Fire TV app store. But even though we could control mouse movements with CetusPlay, clicks didn’t go through. Your results might vary, so try CetusPlay first if you want a free option. 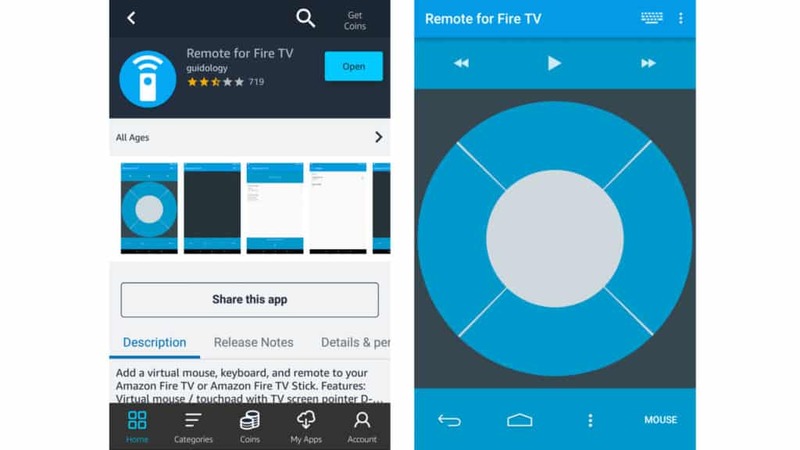 Remote for Fire TV has both Android and iOS versions available. 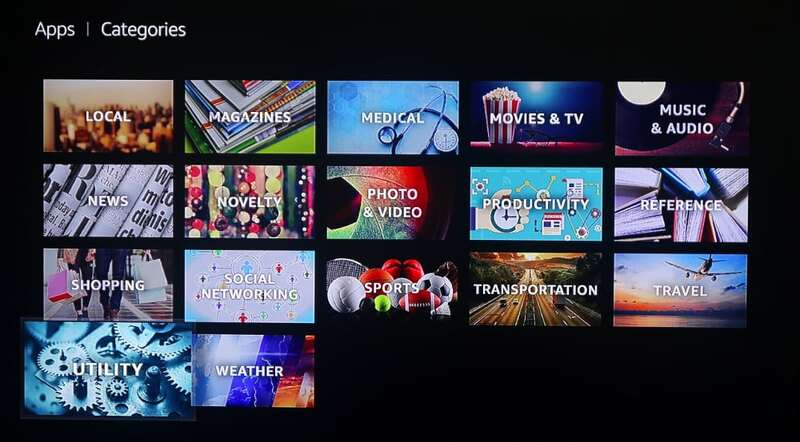 You must whichever app you choose on both the Fire TV Stick and on your smartphone or tablet. The Android version is only available from the Amazon app store and not Google Play. It’s worth mentioning that the developer makes a similar app for Android TV devices with the same icon on Google Play. That is not the correct app. Install the Amazon App Store app on your Android device to get the remote app specifically for Fire TV. As long as you only use one Amazon account, you only need to purchase it once. We didn’t test the iOS version of Remote for Fire TV, and it has a 1-star review as of time of writing, so proceed at your own risk. Some of the reviews say it gets the job done, though. Unfortunately, it looks like iOS users must purchase the app both on Fire TV and on the Apple App Store. The double dipping seems to be a cause for frustration among reviewers. Install the app on your Fire TV, then open it. Make sure the first option is toggled on. The second to start the app on boot is optional. A status indicator near the bottom should say, « Started ». The app runs in the background from here on out. 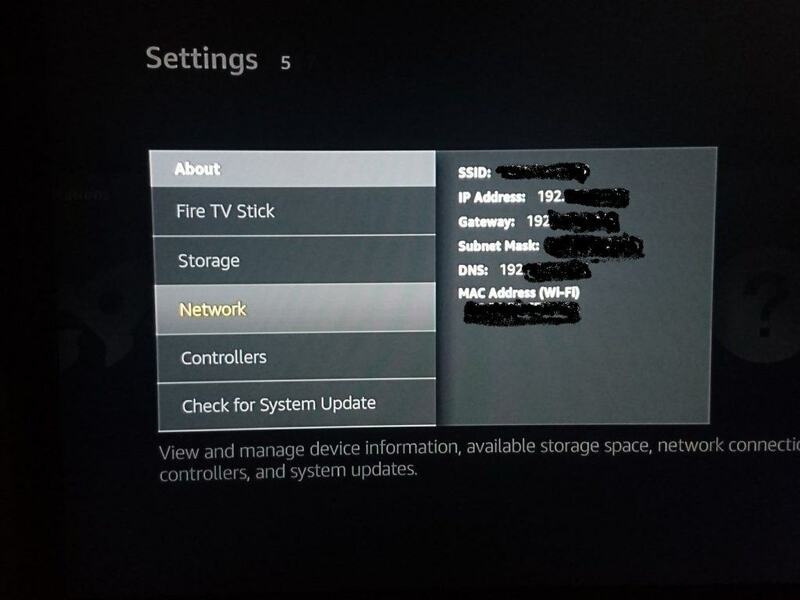 Ensure the Fire TV Stick and the second tablet or smartphone are both connected to the same wifi network. 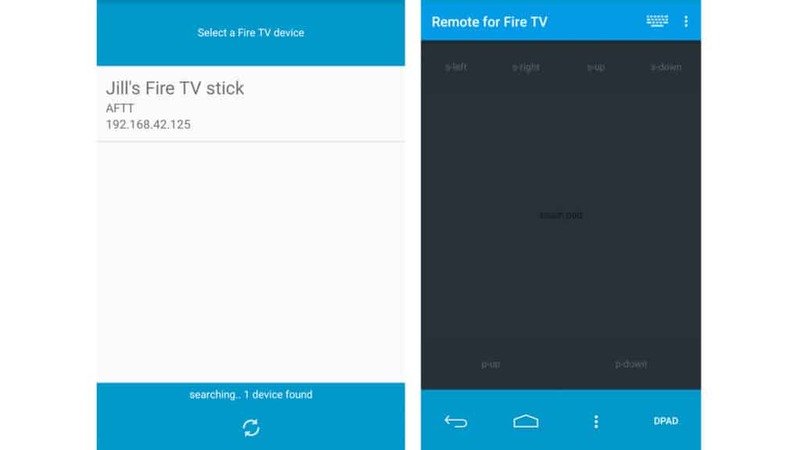 Then find your Fire TV Stick in the phone or tablet app to connect to it. Then you can click the Mouse option and use the screen of your phone like a touchpad on a laptop. Just tap the screen to click. To scroll use the s-up and s-down buttons. One hassle you might encounter with sideloaded Google Play apps and direct download APKs is that they don’t automatically receive updates. If you have a working stable version and it’s secure, then this isn’t so much of a problem. But occasionally you might be forced to update the app. You can compare versions between the « about » or « information » page in the installed app versus the version number listed on Google Play. The process is more or less the same as the steps you took in either method #1 or #2. However, before you begin, it’s important to force stop the existing VPN app. After the update, you will have to log back into the app using the steps in the previous section. If you can’t find a reliable APK file and don’t have access to Google Play on another Android device, or if you’re using the first-generation Fire TV Stick, your options are limited. 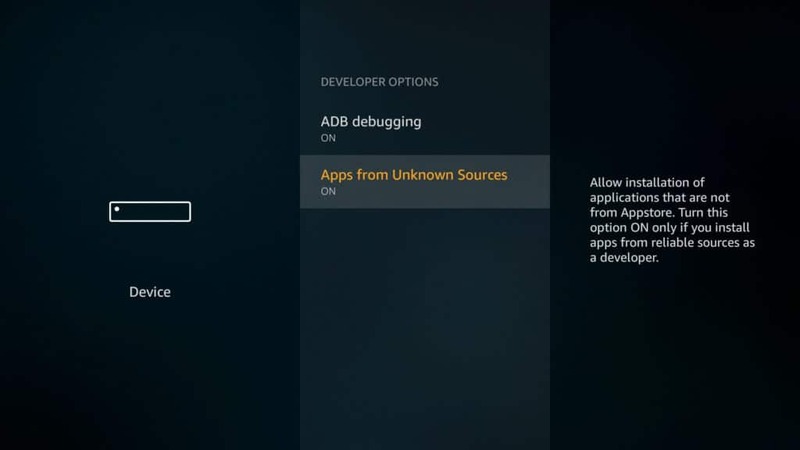 There are ways to download APKs using forged device IDs from Google Play using Chrome extensions, then sideloading them with ADB, but that’s more technical than we’re going to get in this article, not to mention you could be violating Google’s terms of service using those methods. Instead, we recommend setting up the VPN on a wifi router instead of the Fire TV. There are two main ways to do this: setting up a virtual router on a laptop or configuring your home wifi router to use a VPN. Virtual routers are easier to set up but require a laptop to route your traffic through, so it’s not exactly convenient. Setting up a VPN on a physical router only works on certain router firmware and can be tricky, but is much more convenient once properly configured. Both methods work with all versions of Amazon Fire TV and Fire TV stick. Most newer laptops come with the ability to create their own wifi hotspots that other devices can connect to. 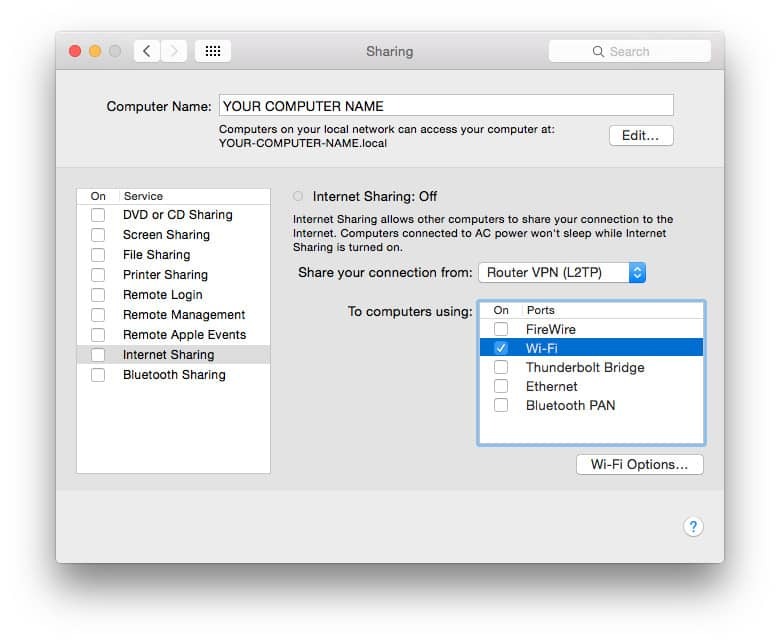 If the laptop is connected to a VPN, then all of the internet traffic from the devices connected to that hotspot is also tunneled through the VPN server. We’ll show you how to set up a virtual wifi router on Windows and Mac, which you can then connect your Fire TV to. This method works even with the 1st-generation Fire TV and Fire TV Stick. Download and install the desktop VPN app for your operating system from your VPN provider’s website if you haven’t already. 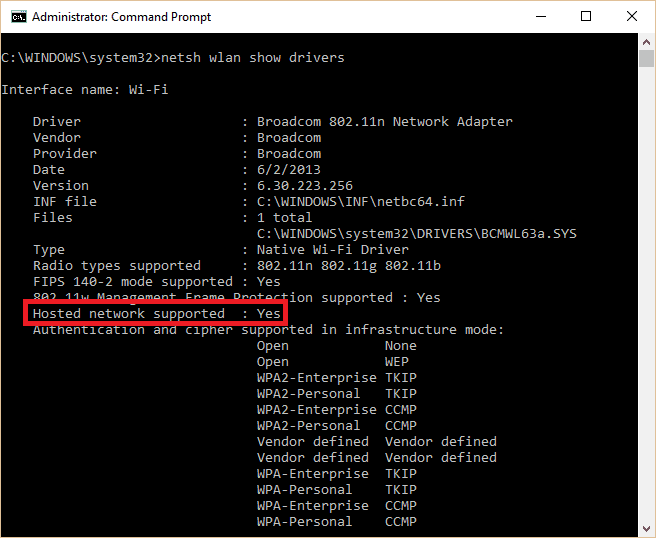 Look for the line that says Hosted network supported. If it says Yes then you are good to go. If not, you’ll have to set up the VPN on the physical router. Help with that further down. 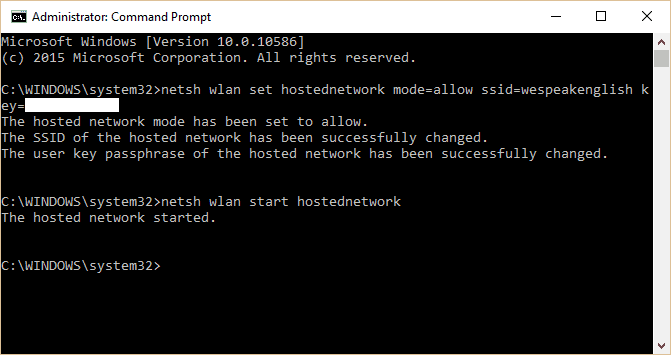 In the terminal window, type netsh wlan set hostednetwork mode=allow ssid=<MY-NETWORK> key=<MY-PASSWORD>, replacing <MY-NETWORK> and <MY-PASSWORD> with the network name and password of your choice, and hit Enter. 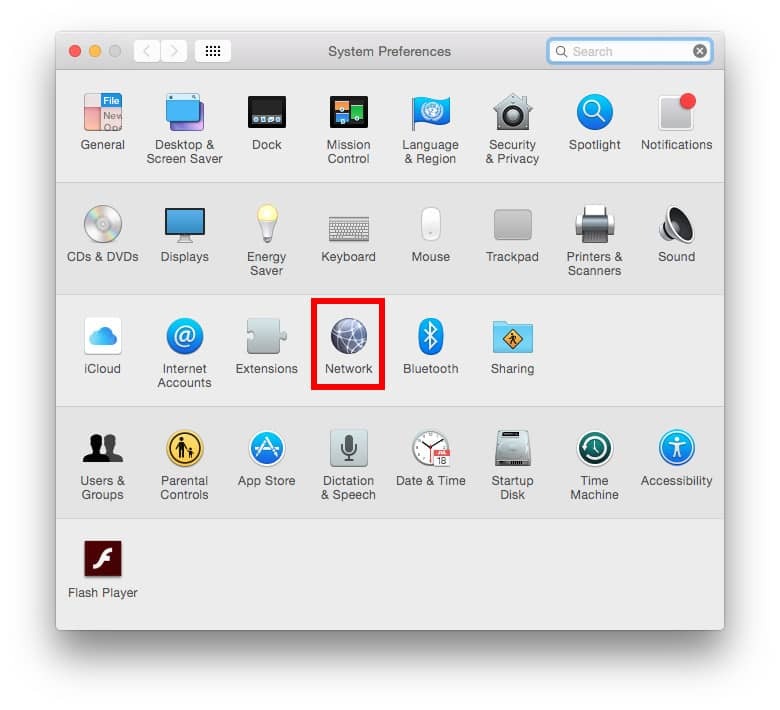 Click the Apple icon to get a system menu, then select System Preferences. Click Create. 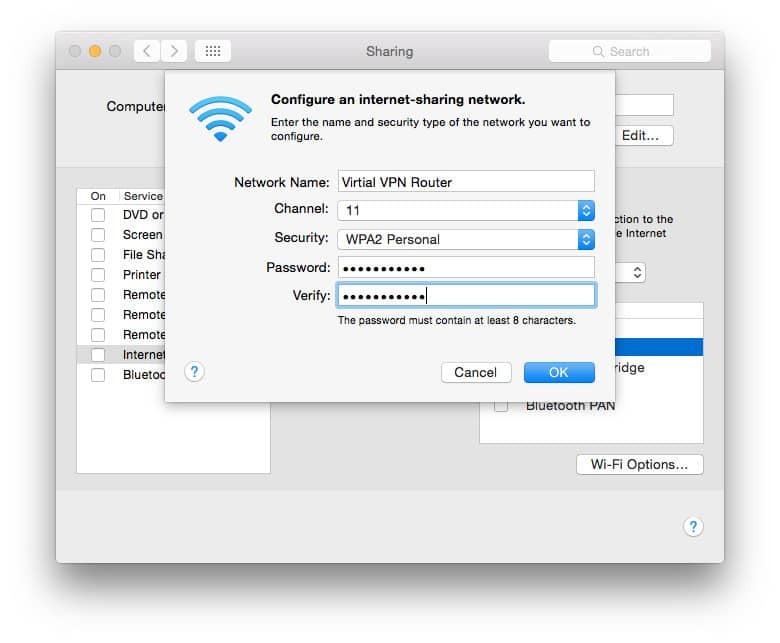 For these next steps you will need your VPN username, password, and a server address. You will probably also need an IPSec key, depending on your VPN provider’s settings, this can also be referred to as a Shared Key or Shared Secret. You can find these under the Manual Configuration section of the VPN provider’s support website. Most providers will also have a list of servers that you can choose from. 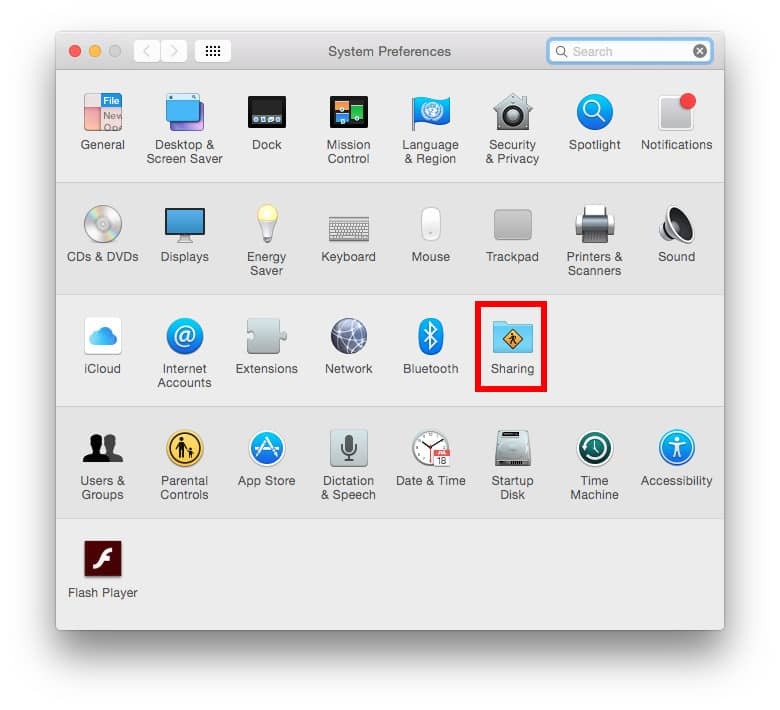 Check the box next to Show VPN status in menu bar to see your VPN connection status in the menu bar. Click on Authentication Settings…. 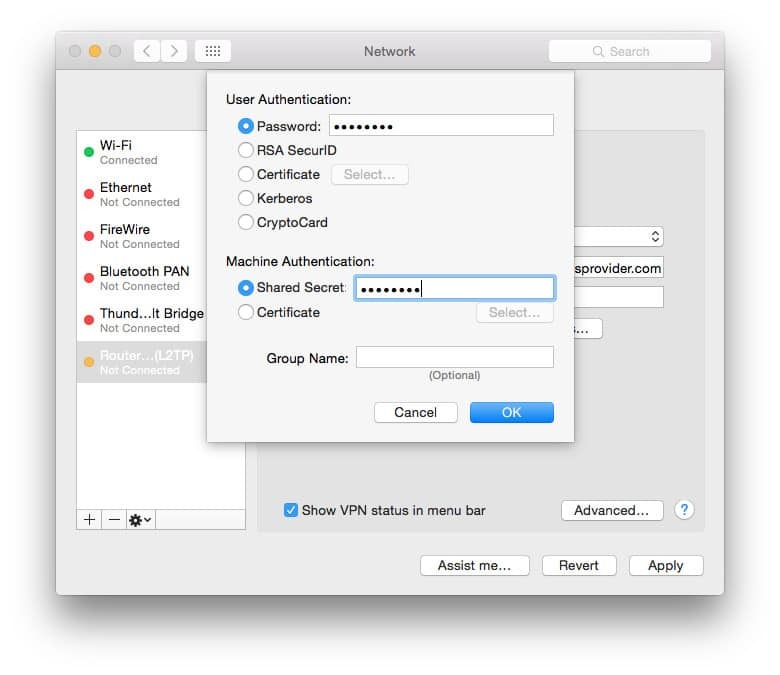 On the User Authentication screen, enter your password in the box and the IPSec key in the Shared Secret box under Machine Authentication, then click OK.
Next, click on Advanced… Check the box for Send all traffic over VPN connection, then click OK.
Click Apply to save all of your settings and then connect to your VPN with the Connect button. You are now connected to a VPN server. 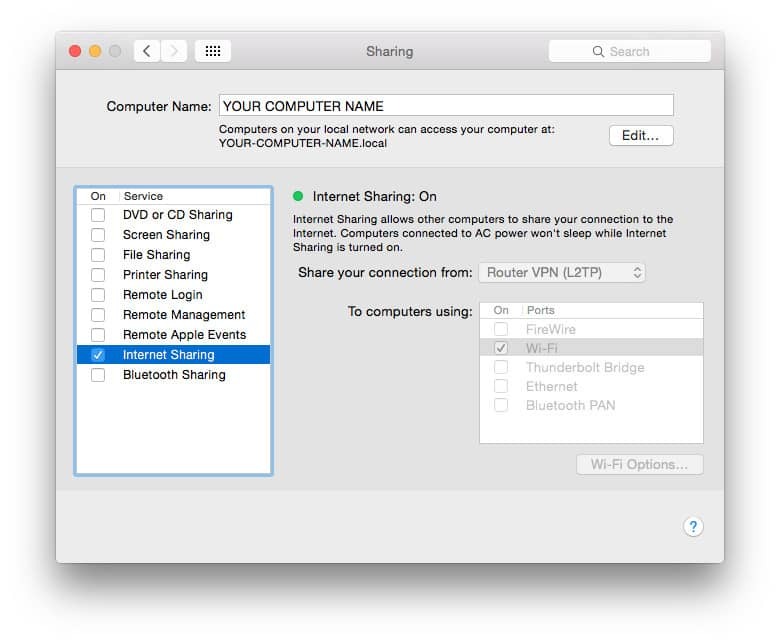 Now you just need to set up your VPN for sharing. 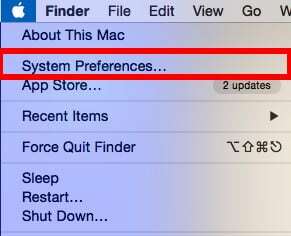 Return to theSystem Preferences menu, then click on Sharing. Open the VPN app and connect! If you select the wifi icon by clicking on it, you will see that it is no longer searching for available wifi signals. 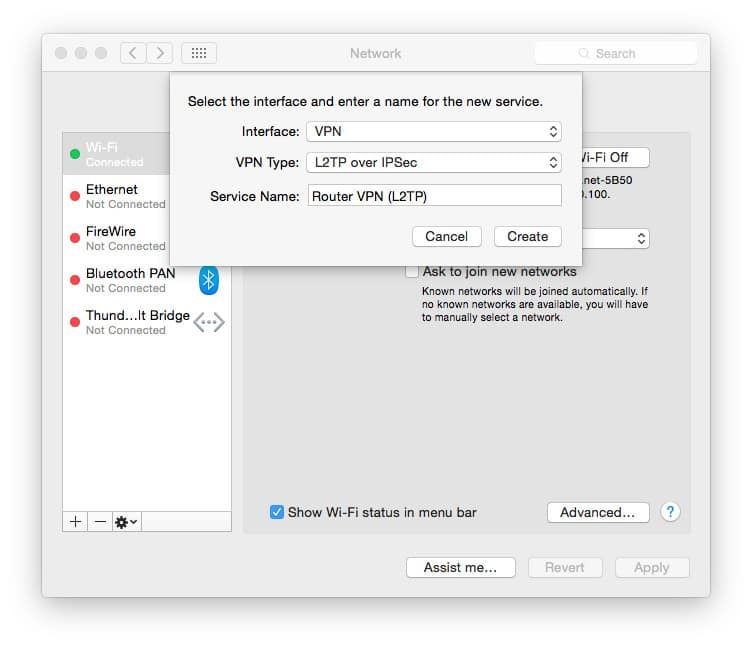 Instead, it tells you that wifi internet sharing is on, the name of the wifi signal that the Mac is broadcasting, in this example “Virtual VPN Router” is our SSID and the wifi channel that the signal is utilizing. You connect your devices to this wifi router the same way as you would to any other wifi, using the SSID and password that you put into the wifi settings screen above. Unfortunately, we can’t give you step-by-step instructions on how to set up a VPN on your home wifi router. Wifi routers come with a wide range of firmware, not all of which support VPNs, and those that do vary in their configuration processes. First, you need to find out if your router even supports VPN connections. You can check the bottom or back of your router for its local IP address and default login info, or you can use Google to find the credentials associated with your particular model. Usually, you can type either 192.168.0.1 or 192.168.1.1 into your browser’s URL bar, and the most common username and password are both « admin ». 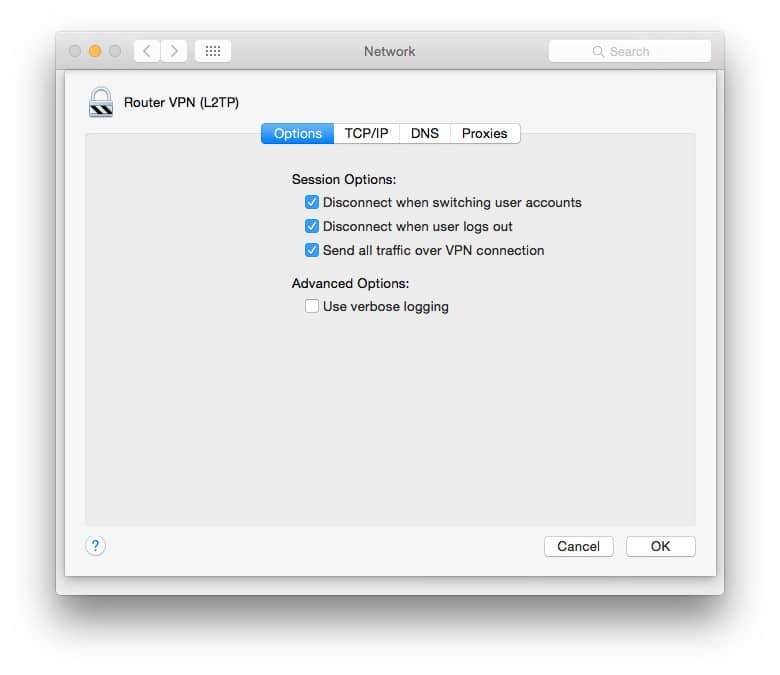 Once you’ve logged into your router’s firmware, look around for VPN configuration. For a typical L2TP/IPSec VPN connection, you’ll need your VPN provider’s server address, username, password, and shared secret. If your wifi router doesn’t support VPN connections, check to see if you can replace the firmware with an open-source solution like DD-WRT, OpenWRT, or Tomato. This process of replacing the manufacturer’s firmware on a wifi router is called « flashing ». Use caution if you decide to go this route. Be sure that the firmware you download is compatible with your specific router. If you mess up, you could permanently damage the router and brick it so that it’s no longer usable. If that’s not something you’re willing to risk, consider a pre-flashed router from a VPN provider. If you connect to a public wifi network (e.g. coffee shops, airports etc.) any other user could access your browsing information. If you’re not using an encrypted connection a malicious user with easily available tools can find out websites you visit, your username and passwords, personal details including your name and address and videos you download and stream. Anyone connecting to public wifi should use a VPN which will encrypt and hide all your browsing activity. A VPN will also mask your online activity if you connect via your home or work internet provider. This is particularly important in countries such as the US where ISPs can legally sell and share your data with other organizations. This data includes sites you visit and the content you stream. 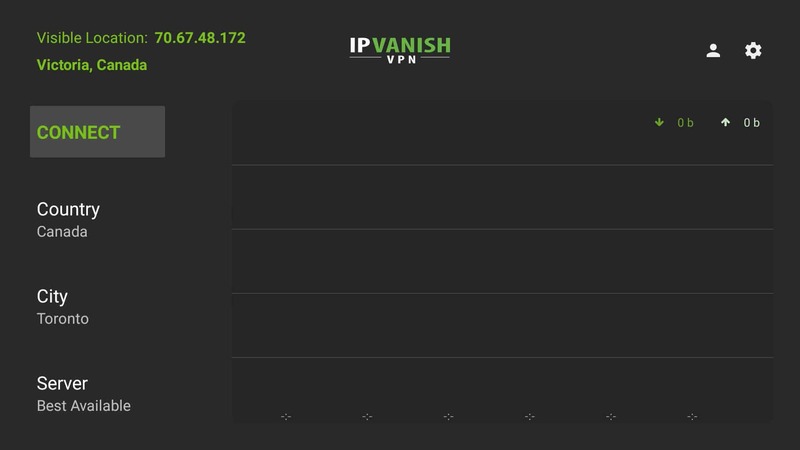 We’ve tested the top VPNs for security and privacy and IPVanish is our #1 choice for Firestick users. Uninstall and reinstall the VPN app. 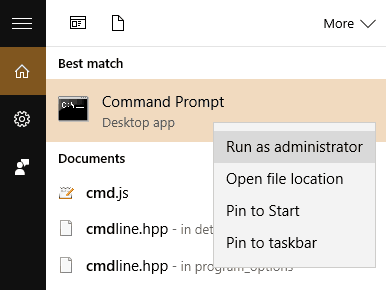 Go to Settings > Applications > Manage Applications. Reinstall using the steps above. Ensure you’re using the latest version of your VPN provider’s app. Restart your Fire TV device by unplugging it, waiting one minute, and plugging it back in. 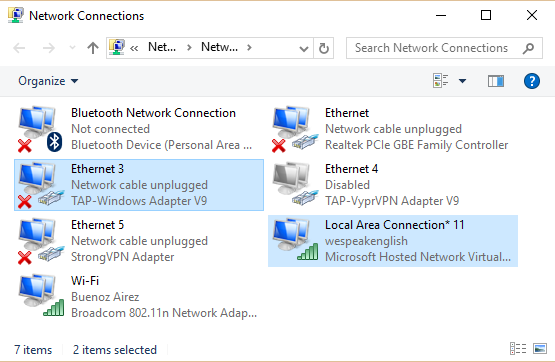 Check that your internet connection works normally without the VPN. Related: Firestick keeps buffering? Try these fixes.